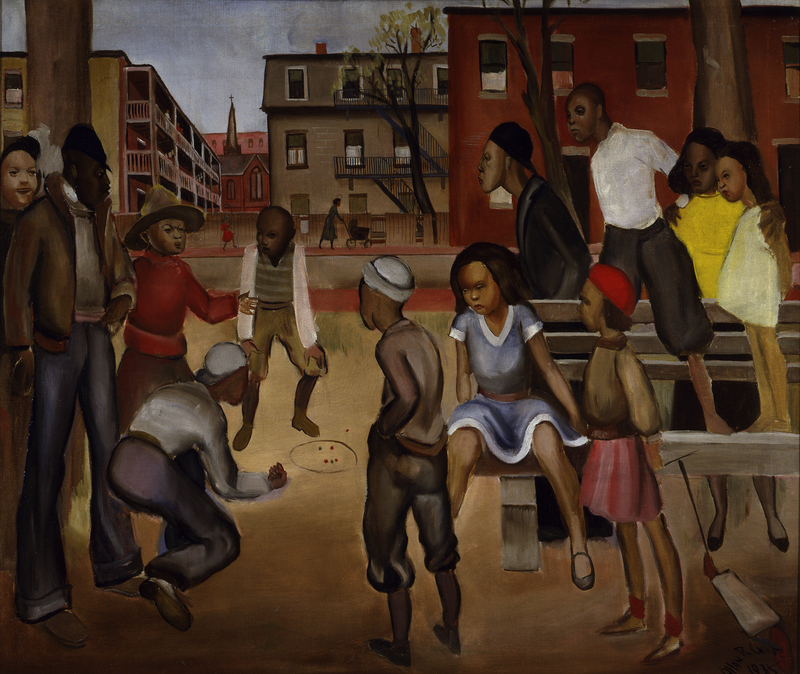 Considering himself an “artist-reporter,” Allan Crite began painting daily life in his own neighborhood in Boston in the 1930s. He consciously avoided the stereotypical images of African Americans dominant in contemporary visual arts, instead depicting his neighbors as ordinary people in quotidian circumstances, busy in the quintessentially American life of work and family. While many of his images assume a straightforward “documentary” approach, Crite painted his subjects, particularly mothers and children, with a distinct reverence that endowed many of his pictures with an almost religious quality. In Marble Players, Crite rendered the children as abstract forms with few details of dress and facial expression, but their energy and lively movements are all the more palpable for it.